The organ in St. John’s Lutheran (“Peace”) Church was constructed by Conrad Doll in 1807. The organ was rebuilt in 1887 by Samuel Bohler after Peace Church built a new church building across the street. Bohler moved the organ to the new building. At this time, he replaced the 10 Principal pipes in the two side towers with zinc replacements and converted the Clarabel into a Melodia by inverting the mouths. The case was also grain painted. In 1954, the organ was moved back to Peace Church. 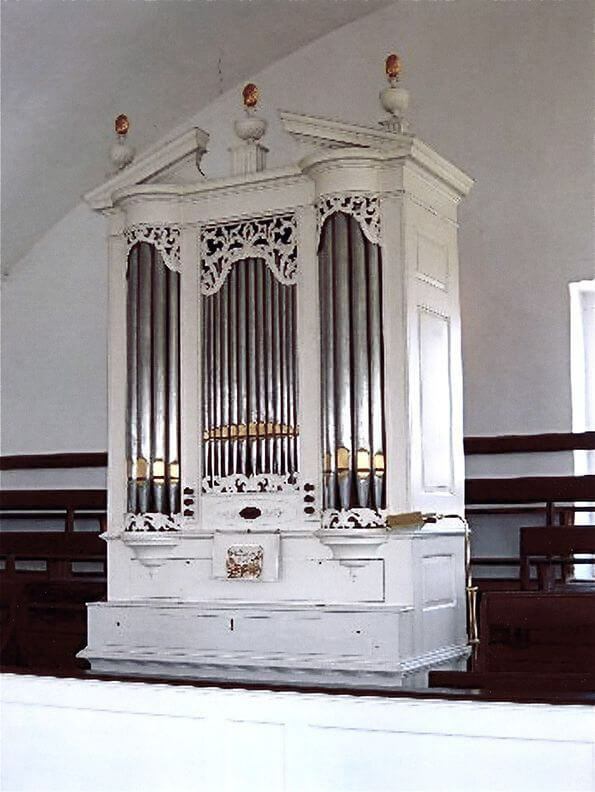 In 1973-1974, the organ was completely restored by the Noack Organ Co. of Georgetown, MA. The Bohler alterations were undone and the case was repainted in its original white.The Gedackt 8′ and Flute 4′ are stopped wood while the Clarabel 4′ is open. Both ranks have walnut trebles as in Tannenberg organs. The Dulciana shares the lowest 15 pipes with the Gedackt.